is an Irish company which uses professional, native translators with at least three years' experience to translate businesses of all sizes. 101Translations was created in 2002 and places special attention on quality control. 101Tran slationswill be available on the Translation Services tab found on the WPML -> Translation Management page. This page is available only after registering WPML. The entire process takes a few minutes. To connect WPML to 101Translations, all you need is the API Token. Find 101Translations on the list of translation services and click Activate. In the next screen, select whether you already have a 101Translations account or need to register. If you clicked No, I don’t have an account, you can request an account and your API Token by visiting 101Translations’ contact page. 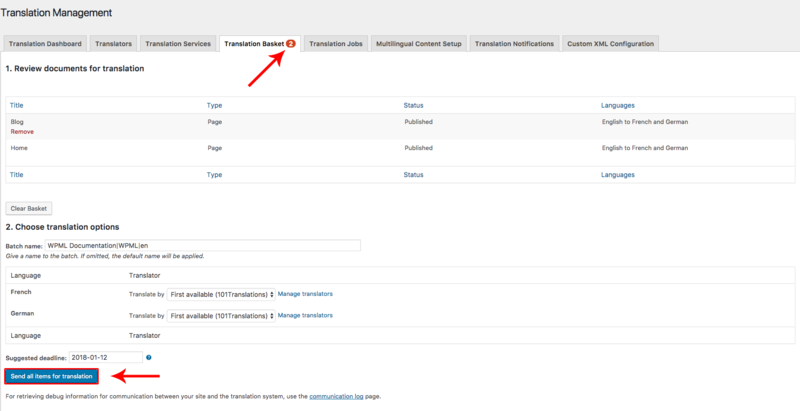 Once you have your API Token, go to the Translation Services tab on the WPML -> Translation Management page. 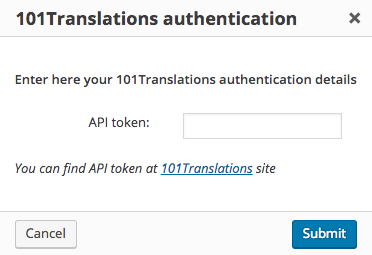 There, enter your API Token to authenticate 101Translations. Congratulations! Your 101Translations account is now connected to your WordPress website. Once your translation basket has been transmitted, 101Translations will be notified immediately and will proceed to carry out detailed analysis and quoting of the batch. 101Translations will email you a detailed quote for the batch, with terms and conditions of business and simple instructions on how to authorize the translation. As soon as a translation job is finished by 101Translations, it will be ready to be delivered to your website.
. To do this, please contact 101Translations directly. Once all the required plugins have been installed and activated, all you need at hand for connecting WPML to the translation service is your 101translations API Token. You can request a 101translations account by simply visiting the 101translations website and clicking the “Contact” button. Alternatively, you can just contact us at info@101translations.com with the details of your website project, the scope, and languages of the required professional translation, along with your contact details including your phone number. After submitting your request, a member of the 101translations team will analyze all your information and contact you to discuss your project requirements in detail. Once you have discussed your project, the 101translations team member will email a unique API Token to you. You will need this API Token to be able to connect with 101translations through WPML. Scroll down to Available Translation Services and click Activate to activate 101translations. A pop-up window will appear in which you can paste or enter your 101translations API Token. After entering the value, click the Submit button. Congratulations! Your 101translations account is now connected to your WordPress account. Here, you can verify the content you wish to translate, remove pages you incorrectly added, and change the Batch name. The Batch name will be visible on the Translation Jobs tab and will help you find projects. When you are ready, simply click the Send all items for translation button to send everything to 101translations. When the translation basket’s contents have been successfully sent to 101translations, you will see a confirmation message, as shown in the following figure. The Translation Service will deliver translations automatically using the XML-RPC option implies that a translation will be delivered to your website automatically as soon as it is ready. Although you cannot cancel individual translations from WPML, you can delete an individual job or an entire project from 101translations by contacting your 101translations Project Manager. NOTICE: Be aware that cancellation requests for previously submitted work should be sent as soon as possible since 101translations cannot cancel translation work that has already been completed: unless your commercial terms state otherwise, you will be charged for the work completed. Go to the Translation Jobs tab and click the Synchronize status button next to the batch you want to fetch. This will trigger a synchronization with 101translations’ servers and all translation jobs belonging to that batch will be downloaded to your site in a few minutes.